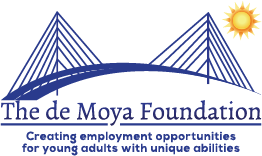 Partner with The de Moya Foundation and inspire our community to open its doors and demonstrate the capabilities of young adults with developmental disabilities! The Foundation will collaborate with educational institutions, not for profit organizations, families, and the business community to provide the educational, employment, and financial support for young adults with special needs to obtain and maintain jobs. Together we can bridge the path to a brighter future, advance the disability employment movement, ensure greater outcomes and success for your business, for the employees, and enhance financial growth in our community.